No indication as to whether or not explosives were the same as Paris attacks. An explosive belt has been recovered in a Paris suburb, a prosecutor's spokesperson confirmed today. There is no indication as to whether or not the explosives were the same as the ones used on Nov. 13, the night of the Paris attacks, according to the spokesperson. The Paris Police Prefecture said earlier today that officials found an item that looked like an explosive vest in the suburb of Montrouge and were working to determine if it could be linked to the Paris attacks. A cellphone signal for Salah Abdeslam, a fugitive wanted in connection to the Paris attacks, was also located in Montrouge on the night of the Nov. 13 massacre, the Paris Police Prefecture said. The prosecutor's spokesperson did not comment on the cellphone. Meanwhile, in Belgium, the city of Brussels will remain on the highest level terror alert through next Monday, the Belgian Prime Minister said today, repeating that officials believe the terror threat there is serious and imminent. The schools and subway are currently closed, but set to reopen Wednesday. The rest of Belgium will stay at a threat level of 3 out of 4, the prime minister said. Overnight, police carried out a series of raids across Belgium and detained 21 people, but failed to capture Abdeslam, whose whereabouts remain unknown, authorities said. Of the 21 people detained, one was formally charged with participating in the Paris terrorist attacks, the prosecutor’s office in Belgium said today. This was the fourth person charged in Belgium since the attacks on Nov 13. Seventeen of those detained were released without charges and three remain in custody for questioning, the prosecutor’s office said. The overnight raids revealed to authorities that the fugitive Abdeslam is not alone, the Belgian prosecutor’s office told ABC News today, adding that authorities will continue to look for Abdelslam and work to identify and arrest those around him. The prosecutor’s office said officials are working to arrest those involved in the Paris attacks as well as stop those who may be plotting new attacks. Officials said they have reason to believe that since some attackers were from the Brussels area, an attack is most likely in Brussels. Authorities are also providing new details on one of the Paris attackers who appeared to have traveled with refugees. French police released this notice for him last week. 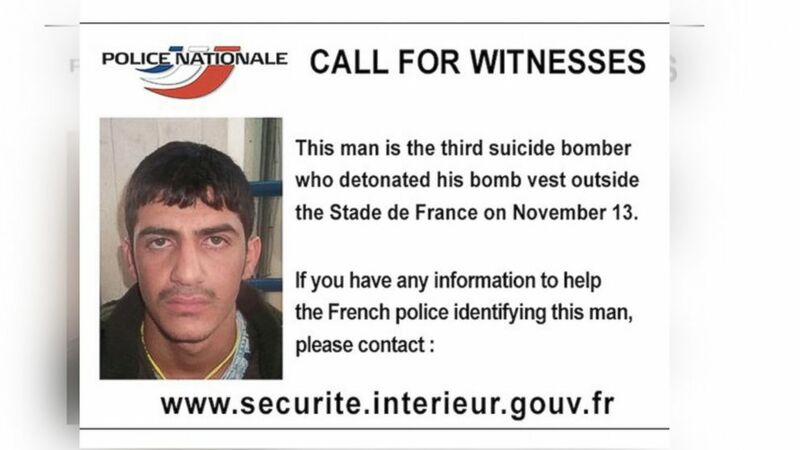 (Police Nationale) French police released this call for information, writing, "This man is the third suicide bomber who detonated his bomb vest outside the Stade de France on November 13." Greek authorities now say that attacker registered with the name Mahmoud Al Mahmoud, which is believed to be a fake name. Authorities did not release other details, such as the date of birth or fingerprints. He was registered arriving among refugees in the Greek island of Leros on Oct. 3 -- the same date and place as another attacker. Greek officials said they have now turned over records of all arrivals in Leros on Oct. 3.